If you are a regular reader of this blog, you know that my husband, John, is my best friend. 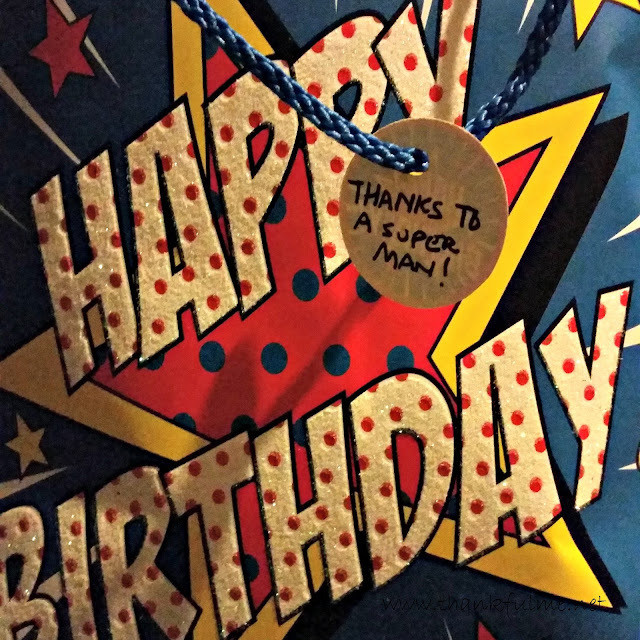 He really is a super person, and today happens to be his birthday. My #ThankfulActs challenge today is to give a silly, yet sincere, "super" gift for a super person. The concept can be as simple or complex as you wish. 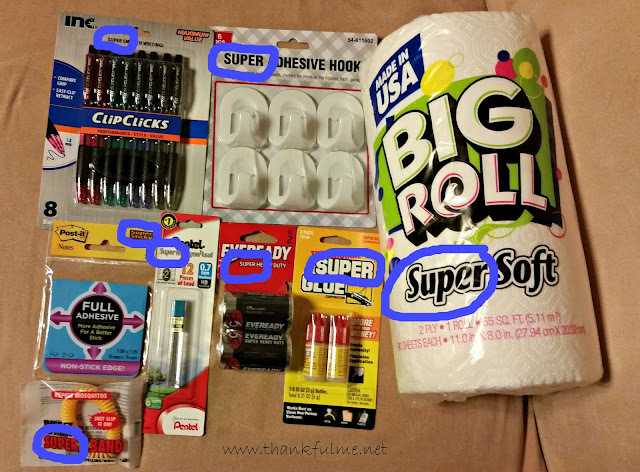 I just went to the 99¢ Store and looked for products with "Super" on the label. I bought whatever seemed appropriate (Super Colon Cleanse did not make the cut!) I ended up with Super Glue, paper towels, mechanical pencil lead, pens, Post-its, batteries, adhesive hooks, and bug repellent. Though those are not the most traditional of birthday gifts, they are useful and fit the "Super" theme. I also threw in a pair of Superman socks (from JCPenney). I put everything in a bag and attached a note thanking John for being such a super guy. Photo: A happy birthday bag with a tag that reads: "THANKS TO A SUPER MAN!" You don't even need to do more than one item; you could give Super Glue to someone, with the label, "You've stuck with me through thick and thin. Thanks for being a super friend!" Have fun with this challenge, and let me know how it goes! Thanks for John, who is Superman to me. Please tell John Happy Birthday from me, too. As for the challenge today, I have to think about this one.